While studying food policy as a master’s candidate at NYU, Leanne Brown asked a simple yet critical question: How well can a person eat on a constrained budget – particularly the $4 a day budget given by the U.S. government’s SNAP/Food Stamp program? The answer is surprisingly well – with the right techniques and recipes. 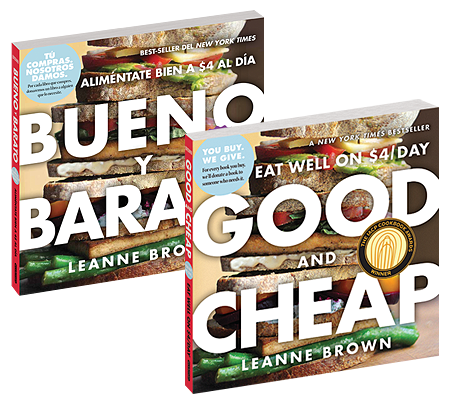 In the GOOD AND CHEAP Cookbook (now also available in Spanish!) Leanne shares the simple secret that makes all the difference: kitchen skill, not budget, is the real key to great food. The 152 delicious and easy-to-make recipes that maximize every ingredient and teach economical cooking methods. Also included are supermarket strategies for shopping on a tight budget, how to stock your pantry with the basics, how to turn leftovers into a delicious new meal, and mastering the simple extras that make everything taste better. If your organization supports people in need, you are eligible for our special bulk discount -- $5.00 per copy, free shipping. (The book retails for $16.95 in stores.) We ship in full carton quantities of 36 books, and the cost per carton is $180.00, free shipping ($5.00 per copy). Please note: Extra postage fees apply for shipments to Alaska and Hawaii. Thousands of organizations, including WIC programs, food pantries, farmers markets, nutrition education programs, health clinics, community action agencies, shelters, and more, have ordered GOOD AND CHEAP in bulk to give to their clients.